The Serene Stamper: Too Much FUN! Do ya know what this is? 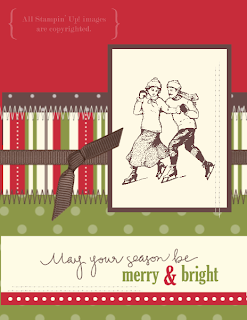 It's my very first greeting card, made with "My Digital Studio" from Stampin' Up!!! So what do you think? Once you get the hang of it, it's SUPER FAST to whip up a FABULOUS project! I love adding the embellishments, such as the stitching. Much faster than pulling out the sewing machine. Once this card is printed I'll be sure to add some Dazzling Diamonds for the 'ice'. I've also made some scrapbook pages as well as some calendar pages. My mind is just starting to grasp the enormity of projects, cards and gifts that can be made using this program. Wowsers! If you'd like some more information about My Digital Studio, be sure to contact me. (This would make a WONDERFUL Christmas gift too! ).